In this post we will build a pipeline for the HPC using Python 3. We will begin by building the foundation for a pipeline in Python in part 1, and then use that to build a simple NGS analysis pipeline in part 2. At NYU, we submit jobs to the HPC using the Slurm Workload Manager. Therefore, we will implement this pipeline using Slurm, however this could easily be substituted for PBS or another similar scheduler. This tutorial assumes basic level familiarity with Slurm and Python. The first thing we will do is build a function in python that will be used to submit jobs to Slurm. The function will submit an sbatch job through the command line using the subprocess python package. Let’s start by taking alook at an example of submitting a simple job Slurm directly from the command line, one that just prints “Hello World”. If you look in my_simple_job.out you should see the text “Hello World”. --wrap: this is the most important part, the command you wish to run. In this example, we simply asked to echo “Hello World”. Let’s put this same command in a python function (we’ll call it sbatch()), and see how we can use this as a template to submit all our jobs. Note that we make use of the subprocess package to execute something on the command line from python. Before we use the subprocess package, we have to import it. sbatch_command = "sbatch -J my_simple_job -o my_simple_job.out -e my_simple_job.err --wrap='echo Hello World'"
Save that as simple.py. If you run this python script (python3 simple.py), you should see a response from sbatch (indicating the ID of the job submitted), and you should find the same file my_simple_job.out with the text “Hello World”. Try change the job name, output file names, or command, and re-run the script. Let’s transform the sbatch function above into something more flexible. We introduce two new parameters to the function: job_name and command. We also make use the string format method in order to build strings easily. Let’s take a quick look at a couple simple examples of the string format method in Python. # prints "Hello Rick Sanchez"
# prints "7 + 2.99 = 9.99"
Let’s go back to our sbatch example. What we have now is a function that we can send a job_name and a command, and the function will build the sbatch command using job_name as the Job Name and stdout/stderr file names, and will put whatever command we give it in the ‘wrap’ argument. Let’s try the same basic Hello World example using our new template. sbatch("my_simple_job", "echo Hello World") # call the sbatch function, but provide job_name and command parameters. Let’s add some additional parameters that we might want to use when submitting a job to sbatch: time, memory, and tasks. We will give each of these parameters a default value so they don’t need to be specified everytime you call sbatch(), unless you want to override them. Let’s also add a mail option so Slurm will email us if our job ever fails. The command above takes the sbatch_response (which is the output of running the sbatch command with subprocess.getoutput()), splits it based on the space (‘ ‘) delimiter, takes the last element (the job ID), and strips away any spaces or newline characters leaving just the job ID. Now let’s implement support for #2: enabling the function to accept an optional dependency parameter. We’ll start by adding a parameter called dep to the sbatch function definition and assigning it a default value of nothing (empty string). Now we’ll add a couple new lines at the top of the function to check if the dependency is empty or not, and add the required parameters to the sbatch command if it’s not empty. We also add the lines to parse the and return job_id. Note that the dep parameter is always included in the sbatch command that we send to the command line. If there is no dependency specified, then dep will be an empty string. We now have a function that can be used to build a fully functioning pipeline with dependencies! In part 1 we built a template function to submit jobs to the HPC. In part 2, we will use this function to build a pipeline. 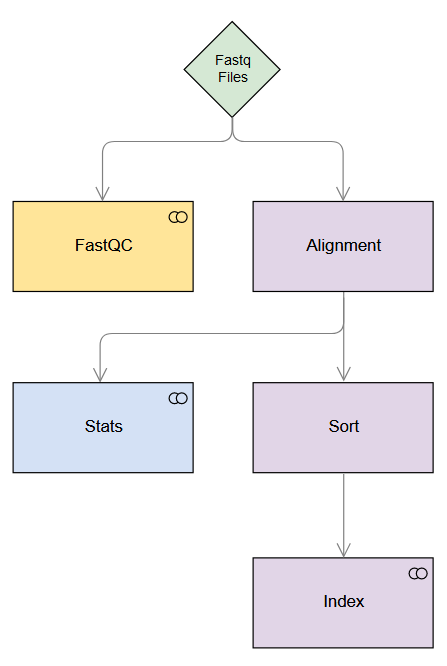 For the purpose of this tutorial, we will implement a simple NGS analysis workflow consisting of FastQC, alignment, sorting, indexing, and generating alignment statistics. Using dependencies in a pipeline allows us to maximize the resources we can use while minimizing the wait time to run our jobs. This also allows individual jobs to run in parallel (where possible), reducing our overall analysis time even further. The figure below depicts the simple pipeline we will build. Note the dependencies (indicated with arrows) and the steps which run in parallel (same row). We’ll use a single-end fastq file and we’ll align to the Unicorn genome. For the purpose of this exercise, we’ll assume the index files for the aligner are already built. We’ll build a function for each step of the workflow to keep things organized. These functions will call the sbatch() function we created above. Note: The next three steps require a dependency, i.e. they require a previous job to complete before they can be started. For this reason, we will add the dep parameter to the following functions. command = "samtools flagstat output.sam > stats.txt"
command = "samtools sort output.sam -o output.sorted.bam"
command = "samtools index output.sorted.bam output.sorted.bai"
Now that we have all our individual functions for each step built, we can stitch them together in a pipeline. Most of the heavy lifting is already done, this part is the easiest. c) Load respective modules (required for NYU’s HPC). I add this directly into the command for each step. Post below if you have any questions and I’ll do my best to answer.